The wheels on the bus go 'round and 'round, which means that your children need to understand the importance of safety when waiting for the bus, riding on the bus, and getting off the bus. 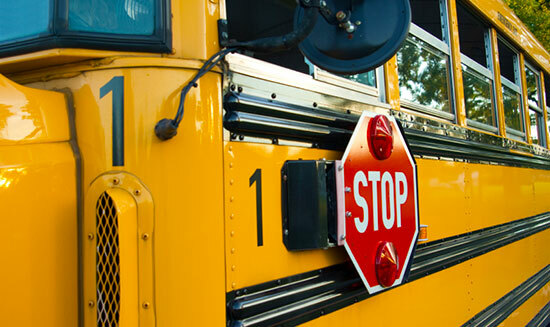 Encourage your kids and students to follow these school bus safety tips. Doing so may just save their life. Dress appropriately – coats for colder weather, shoes with tread if it's icy or snowy, etc. Arrive at the bus stop a few minutes early so you won't have to run across the road or rush to catch the bus. Stay away from the curb while waiting for the bus. Wait until the school bus has stopped all traffic before stepping out onto the road. Never run after the school bus if it has already left the bus stop. Don't push getting on or off the school bus. Be patient and wait your turn. Use the hand rail, especially if the stairs are slick from rain or snow. Many buses have a yellow bar that swings out from the front of the bus, but if not, remember to walk at least 10 feet in front of the bus when crossing so that the school bus driver can see you. As a parent, guardian, or driver, be sure to follow all school bus laws. If you're convicted of violating Pennsylvania's School Bus Stopping Law, you will receive a 60-day suspension of your driver's license, 5 points on your record, and a $250 fine. After getting onto the bus, find a seat quickly. Don't rough-house while riding the bus. Doing so can distract the bus driver and cause accidents. When the school bus is moving, always stay in your seat. Never put your head, arms or hands out of the window. Don't set back packs or bags in the aisle. Remove any tripping hazards as soon as possible. Don't play with the emergency exits, and don't block them with backpacks or bags. If there's an emergency, listen to the driver and follow instructions. Only two people should sit in a school bus seat, unless it's specifically designed to hold more. If the bus is equipped with seat belts, we recommend using them. Don't stand up to get off the bus until the bus has come to a complete stop. Use the handrail when getting off the bus. Walk in places where there are sidewalks if at all possible. If you need to walk on a road without sidewalks, walk on the left-hand side of the road facing traffic. Stay as far away from the road as possible, and walk in a single-file road. Walk at least 10 feet in front of the bus or in front of the yellow swing bar. Make sure the bus driver sees you before you cross the road, and watch for drivers who don't follow the state school driving laws. Students should keep away from parked cars or other objects that may block them from view. If you need to cross the street, use a crosswalk with a crossing guard if possible. Follow these pedestrian safety tips to help prevent injuries. If you leave something on the bus or drop something on the ground near the bus, don't go back for it. If your child was injured in a car accident involving a school bus or hit as a pedestrian walking to or from school, you may wonder if you have a case. Do you need a lawyer? What are your legal options? What should you sign or not sign from the insurance company? When you have questions, Edgar Snyder & Associates has answers. Call 1-866-943-3427, or fill out the form at the top right of this webpage for a no obligation, free legal consultation. Our phones answer 24/7 – we know that your child's health is your top priority. Contact us now.